Refreshingly chilled but with a subtle tartness and acidity, there's a reason why tomato gazpacho is such a classic spring and summer soup. 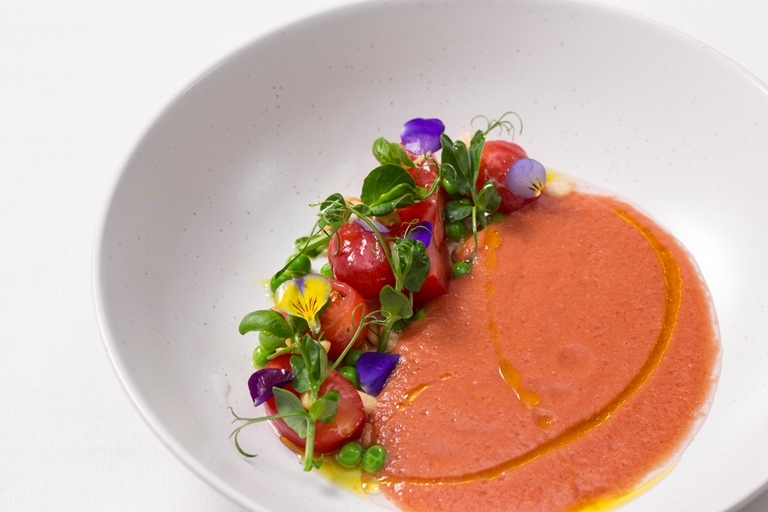 Paul Welburn lets the high quality ingredients speak for themselves in his gazpacho recipe, infusing the soup with cucumber, red pepper and basil before blending and garnishing the dish with fresh peas, crunchy pine nuts and a mix of tomato textures from pickled and raw pieces on the side. With the soup and pickled tomato prepared the night before this stunningly presented dish works well as an easily assembled dinner party starter.